DEADLINE TO APPLY FOR SPRING/SUMMER 2019 INTERNSHIPS: Tuesday, February 26th at 12pm ET. Do you love talking about food almost as much as you love eating it? If the answer is YES, then an internship at HRN is for you! Our internship program is open to undergrads, grad students, and post-grads. All internships are part-time. While our most popular internship focuses on radio and research, we also offer positions in the areas of editorial, development, and social media. 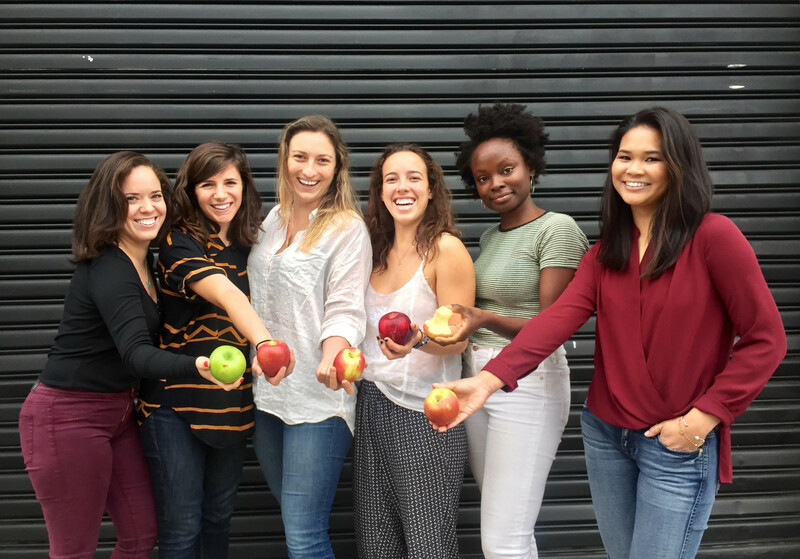 Interns in 2017 celebrating Cider Week! HRN internships last for six months and we ask our interns to work 2 days per week (either Wednesday+Thursday or Wednesday+Friday). Positions are unpaid, but can be applied towards school credit. Interns at HRN have the opportunity to engage with a community of journalists, food producers, chefs and leaders (and go on some pretty great outings to farms, restaurants, museums, and more)! Working at HRN means making a serious commitment to improving the food system and helping to create an exceptional workplace. We are a passionate group of hard workers. While prior experience isn’t required, an interest in media, nonprofits, food, and/or agriculture is a huge plus. We’re looking for self-starters who are able to set priorities and work independently, but can also collaborate and work as a team. If you’re adaptable and comfortable with the evolving demands of a small organization, you’ll fit in at HRN! What do interns do at HRN? Our interns are an integral part of our team. No matter which position you’re in, you’ll assist with writing, audio production, promotion, fundraising, event planning and more. You’ll also have ample opportunity to build a portfolio of polished written and audio pieces, culminating a capstone project. Check out some of our interns’ past work here, here, and here. We hire interns on a rolling basis. Email [email protected] with a resume, cover letter, and writing sample. Let us know if there is a specific role you’re interested in (see below). We’re a small team, so everybody helps out with various administrative duties in addition to content production. Your role at HRN will largely depend on your strengths, initiative, and what needs to be done on any given week. Help us increase listenership, boost public awareness, and enhance engagement with our 34+ weekly shows and daily news coverage. You will curate existing HRN content through audio and web features, research and assist with planning interviews, and produce audio and editorial content about network activities and partners. Take a creative approach to writing, content management and promotion through editorial features. You’ll plan and produce editorial content about network activities and partners and write original content for the HRN blog. Work closely with HRN’s Development and Membership Coordinator to grow individual membership, business sponsorship, underwriting support, and grant funding. Support our fundraising events, including our Winter in the Garden annual fundraiser. Focus on social media strategy for individual shows and news pieces. You will disseminate relevant content and news to HRN’s social media outlets.